General Custer and the Battle of the Little Bighorn. Pavilion Books (Michael Joseph), 1985, 447 p.
This book does what it says on the (subtitle of the) tin. It is an account of the fatal (to Custer’s Seventh Cavalry troop) encounter at the Little Bighorn. I say encounter, as to describe an engagement involving so few combatants on the one side as a battle is stretching things a bit. Compared to those of the US Civil War in the previous decade and of the century following it was really only a firefight. Account is also misleading. Along with everyone else Connell does not really know exactly what happened. None of Custer’s troops survived, the Native Americans who fought them did not know till later it was Custer attacking their camps and their recollections are beset by translation difficulties and their custom of noticing those things which made sense to them rather than to historians from outwith their culture. The narrative begins a little oddly, with a description of the engagement’s aftermath, specifically of Major Reno’s and Captain Benteen’s commands whom Custer had detached from his own to attempt a pincer movement. Here is a first indicator of the range of Connell’s project. He goes into details of both these officers’ lives – before and after the Little Bighorn – and when referred to gives us biographies of all the notable characters who had anything to do with the events of that day (and even of some of those who didn’t.) All interesting stuff, but leading to a certain lack of focus. 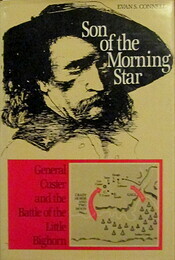 Custer’s misjudgement in attacking a force of whose size he was unaware was not a one-off. He had acted similarly in the Civil War, where his tendency to charge at anything without adequate reconnaissance and (not) think later became almost a trademark (and he got away with this against Indians at the Battle of the Washita, gaining his unearned reputation as an Indian fighter.) But then, what else is to be expected of a man who graduated twenty-fourth out of twenty four in his year at West Point, with the most demerits of any such student to that time? Indeed his rise in the ranks during the Civil War could be said to be without trace as none of the actions in which he was involved (not that they are explored in great detail in the text) indicated any intrinsic military ability. But they did catch the eye of his superiors. In an interesting aside Connell states that any photographs said to be of Crazy Horse are most likely of someone else. He would apparently sit for paintings but felt a photograph would steal something from him and refused to have his picture taken. Also, one observer noted he lacked the usual high cheekbones of the North American Indian and had a pale skin colour. Connell does not suggest this but that seems to me to imply he could have been of white ancestry, though brought up as a Cheyenne. And all for what? Canada had no Indian problem – mainly due to the fact that the Canadian government kept its word. It wasn’t the Indians who broke treaties. Custer’s fate was sealed as soon as the presence of gold was confirmed in the Black Hills of Dakota. Nothing could then have stopped the influx of prospectors and the inevitable protection they demanded from the US government in the name of progress. Pedant’s corner:- *Is this the Bruce A Rosenberg of the bibliography, author of Custer and the Epic of Defeat? Otherwise; Sturgis’ (Sturgis’s: the possessives of all names in the text ending in “s” are rendered similarly,) teepees (tepees,) diety (deity,) Macawber (Micawber,) idyls (idylls,) witnesss (witness,) Congressional stationary (stationery,) as to “knobby days”, and “whiffenpoof” I can’t find a definition.